Lewis Hamilton has dominated a thrilling Brazilian Grand Prix to take the 2016 world championship to the final round in Abu Dhabi. But the Briton had to manage six safety car restarts, including two red flag periods, in the rain-lashed race to claim his first win at Interlagos. “I was generally just chilling up front,” said the winner. “When it rains it’s usually a good day for me. 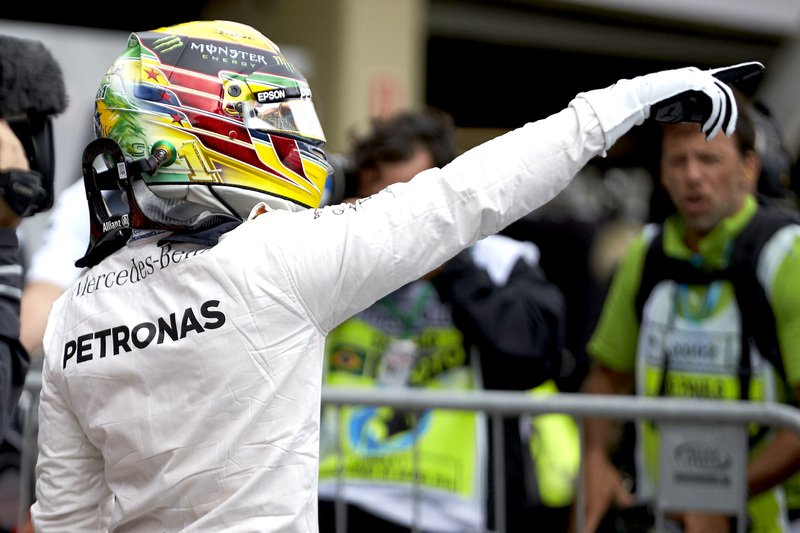 Hamilton’s win cut Rosberg’s championship lead to 12 points, sending the title fight down to the wire. “I’m hunting, and all I can do is do what I’m doing right now,” Hamilton said. Hamilton first challenge — to hold first place from pole position — was made easier by race control starting the race behind the safety car due to weather so bad that Romain Grosjean crashed his Haas on his reconnaissance lap. The field circulated behind the pace car for eight laps before race control allowed the cars to fight for position, and it took just one lap for Jenson Button to sample the intermediate tyres, followed by six more cars a lap later. But the conditions were proving to variable, putting the weather somewhere between wets and intermediates, leaving those drivers who gambled on the intermediate rubble languishing at the bottom of the time sheet. Racing lasted only five laps, though, and when Sauber’s Marcus Ericsson crashed his car leading onto the front straight the safety car was deployed to control the field. Race control green-flagged the race on lap 20, but mere seconds into the resumption Kimi Räikkönen lost control of his Ferrari from third on the pit straight in an accident lucky not to collect other cars. The race director had little choice but suspend the grand prix under a red flag to clear the debris, but though marshals were able to clean the circuit, the rain intensified so much that the cars remained stopped for 35 minutes. The field ventured out behind the safety car, but it took 10 minutes for safety car driver Bernd Maylander and race director Charlie Whiting to realise conditions were still too poor for racing, again forcing a red flag. It took 27 minutes and eight laps behind the safety car for racing to resume, at which point Max Verstappen, who had inherited third from the crashed Räikkönen, pounced on Rosberg to seize second place and began putting pressure on Hamilton’s lead. But the Mercedes’s pace was enough to neutralise Max’s pace, so Red Bull Racing — after Verstappen masterfully saved his car from going into the wall near where Ericsson’s car had crashed — gambled his podium on an early change to intermediates. Four laps later Felipe Massa crashed his Williams at the entry of the pit lane, marking an emotional send-off for the Brazilian’s last home grand prix. While the fans cheered off their driver, Red Bull Racing looked to have made the strategy call of the race because Massa’s crash scene prevented the Mercedes cars from making a free pit stop to mimic Verstappen’s intermediate tyre change. Behind the Massa-induced safety car the Mercedes drivers were complaining of tyre wear on the drying track, teasing a tense conclusion to the race, but heavier rain swung conditions back in favour of the silver arrows, forcing Verstappen to make a costly change back to the wet tyre that dropped him to sixteenth. On lap 56 the safety car returned to the pits for the final time with Hamilton and Rosberg leading the race with Sergio Perez and Carlos Sainz, who had followed Mercedes’s strategy to change tyres only under red flags, se to battle for third place. However, in a final twist the prime mover of the last stint was Verstappen, who used his relatively new wet tyres to recover his lost podium. First Kevin Magnussen, then Esteban Gutierrez, Pascal Wehrlein, Valtteri Bottas, Daniel Ricciardo, Daniil Kvyat, Esteban Ocon, Felipe Nasr, and Nico Hülkenberg — Verstappen passed them all by lap 65. Sebastian Vettel for fifth was next on lap 66 in a move that put the Ferrari off the circuit in the final sector. By lap 70 the Red Bull Racing car has passed Carlos Sainz and Sergio Perez to put himself third, ending his charge through the field. Sergio Perez finished fourth and his Force India teammate, Nico Hülkenberg, finished seventh, winning 18 points for the team on a day Williams failed to score. The margin between the two leading midfield teams is 27 points with one round remaining, giving Williams only a mathematical chance of overhauling its rival for the lucrative fourth place in the contractors standings. Felipe Nasr gave his home crowd fans something to cheer about by scoring his first points since last year’s United States Grand Prix, in doing so promoting his Sauber team into tenth and above Manor in the teams championship standings.